The Bar-tailed Godwit Limosa lapponica holds the record for the longest not-stop flight of any bird on migration. It is very scarce in Borneo, this particular bird seen last month was only my second sighting. I can only assume that the bird only stopped here briefly to refuel and would have continued on its way to Australia. 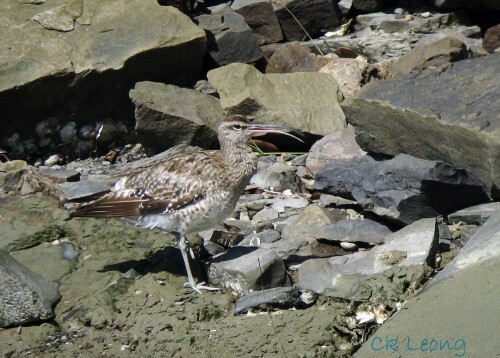 Another winter visitor here is the Whimbrel Numenius phaeopus. This bird is the most common of the curlews passing through Borneo but we do see it present throughout the winter season. 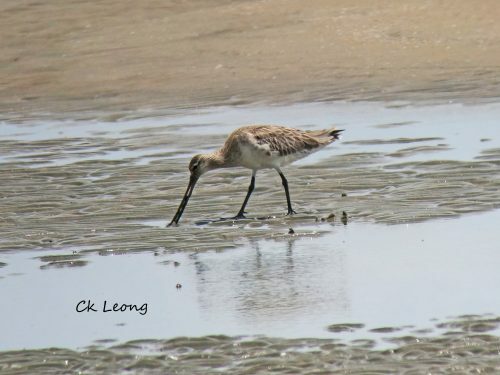 This particular lone bird was seen along the seashore in Kota Kinabalu but on a previous occasion I saw a big flock on a few mangrove trees near Mumiang at the mouth of the Kinabatangan river.